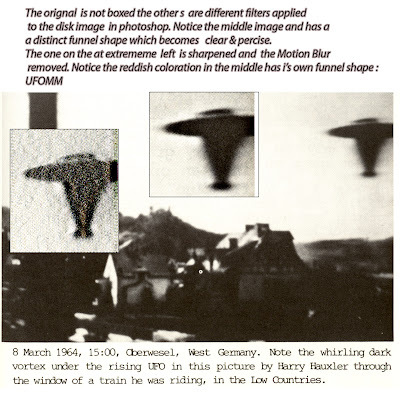 UFO Media Matters: UFO Are Just Secret Weapons! UFO Are Just Secret Weapons! 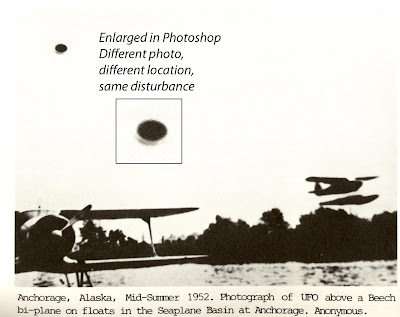 When anyone, who looks rather intelligent, dressed in all the right accouterments, has letters after his or her name, tries to tell you in a "I have all the data ready tone" "UFOs are just "Secret Weapons" pause....laugh, and asked that person... in which century? Below I will present unique photos from the past. These photos I show below are presented here by permission, and with my thanks, to WENDELLE STEVENS. I never recommend anything I don't really like. I really was fascinated by this two book set. There recounts of "Fatima", which include the first drawings by one of young girls, is fascinating. the sketches show what looks like a "being of light". 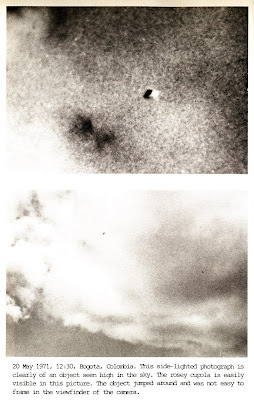 The picture of the UFO at Fatima had me conjuring up my "Staging Theory. " The Photo's you will see below revel a story of the old and the new. This story of a world of regular people seeing UFO"s and taking photographs has been overlooked in our McDonald lifestyle. This was not a digital world at all, this was a world with 35mm, Polaroid and Instamatic's cameras,. 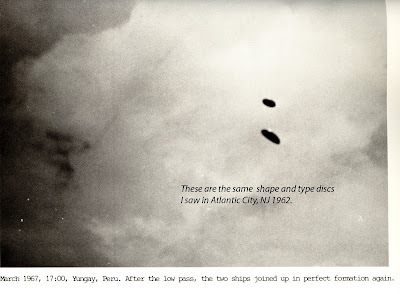 A world of UFOs which still calls to us about truth beyond hoaxes and beyond any persone's discounting explanations. 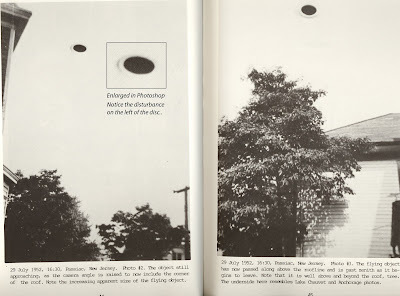 The Two Photo's here were taken in Passiac N.Y.
Now for some comparisons from Alaska notice same disturbance. Now compare this photo taken 1972 with one from a DVD clip I posted on "You Tube" under "jcappufo". Notice the back of the saucer especially and the a small bright light source. These are the almost identical to what I witnessed, with a friend, fly over an Atlantic City Beach in 1962. They ones we viewed were very close and their color was a deep copper type color.